Cue Card and stablemate Thistlecrack collide in what promises to be a compelling renewal of the 32Red King George VI Chase at Kempton Park on Boxing Day. Who will win the £200,000 contest? 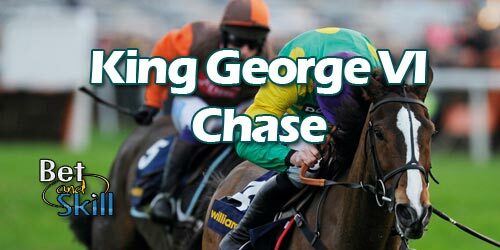 This article contains our 2016 King George VI Chase betting preview including tips, predictions, enhanced odds, bookie bonuses and no deposit free bets on the race! Cue Card has won 15 of his 33 starts, eight of them at the top level. He finally won a King George at the fifth attempt last year just managing to overcome Vautour in arguably the finish of the season. Colin Tizzard's chaser enter this race on the back of a 15 lenghts vicotry over Coneygree in the the Betfair Chase last month. Unbeaten since November last, Thistlecrack has won nine of his ten starts over three miles and was unlucky not to win the other when meeting trouble-in-running at Punchestown. He was a revelation over hurdles last season, winning the World Hurdle in incredible fashion and he has just made a transition to fences. His jumping remains a concern against experienced and talented rivals as he has only beaten a combined 11 rivals over fence. Josses Hill had some teething problems with the bigger obstacles last season but four wins from ten starts over fences, including both starts this season here at Kempton and then in Peterboroguh Chase at Huntingdon over two and a half miles, makes him a real contender. Tea For Two recorded an impressive win here in the Novices' Chase on Boxing Day last season over the same three miles. After nine months off, he finished 5yh in a Grade 3 handicap chase at Ascot in October and improved again when a six-length second to Josses Hill in the Peterborough Chase at Huntingdon earlier this month. Silviniaco Conti won this race in both 2013 and 2014, though was pulled up in the latest renewal after travelling well for a circuit. He showed he is no back number after seven months off when 11 lengths second to the Lexus favourite Valseur Lido in the JNwine.com Champion Chase at Down Royal but took a backwards step when a well-beaten fourth to Cue Card in the Betfair Chase. "2016 King George VI Chase predictions, betting tips, odds and free bets (Boxing Day - Kempton - 26.12.2016)"